P-Q2 analysis is a standard procedure used to optimally match the target gate velocity to the capabilities of the HPDC (High Performance Die Casting) machine’s plunger hydraulic system. Desired fill time and an optimum gate design can be attained by performing P-Q2 analysis, which in turn, maximizes the efficiency of the HPDC system. As shown in a typical P-Q2 diagram below, the machine performance line shows how the die casting machine capabilities vary depending on the flow rate. A larger flow rate demands a larger pressure from the machine to move the plunger at desired velocity. This means that, the higher the pressure, smaller the plunger, and the higher the flow rate, the larger the plunger. The operational window is defined by the fill time, gate velocity, metal pressure, etc. It is important that both the die and machine operate within the operational window (Figure 1). 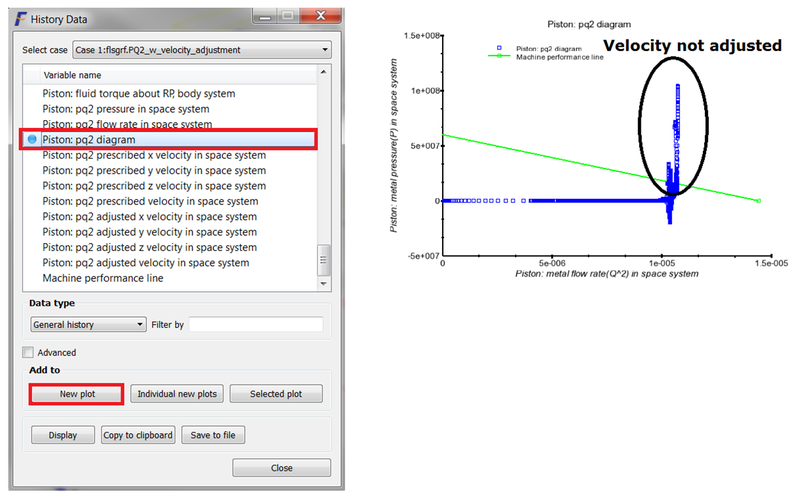 To perform P-Q2 analysis, the Geometry Type of the piston must be defined as Plunger. This can be done when you add the piston to your geometry (Geometry -> Add geometry). Enable P-Q2 analysis by selecting the Perform PQ^2 analysis option in the Details tab of the component, Piston (Figure 2). 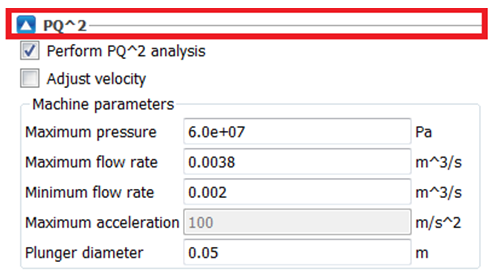 Enter the machine parameters (Figure 3) to define the machine performance line. 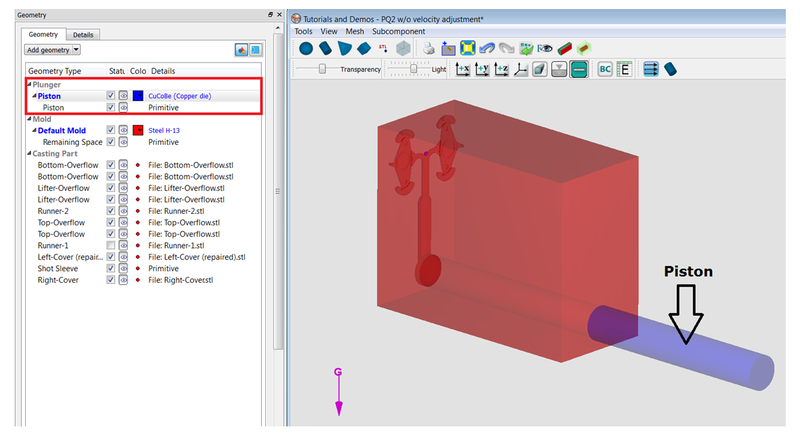 During the design stage, the user specified process parameters may not be optimal, for instance, the resulting pressure is beyond the machine capability. If so, toggle on the Adjust velocity option for the piston velocity to be automatically adjusted to match the machine capability. Now, the flow rate will be adjusted at each time step if the pressure at the piston head is beyond the machine capability. 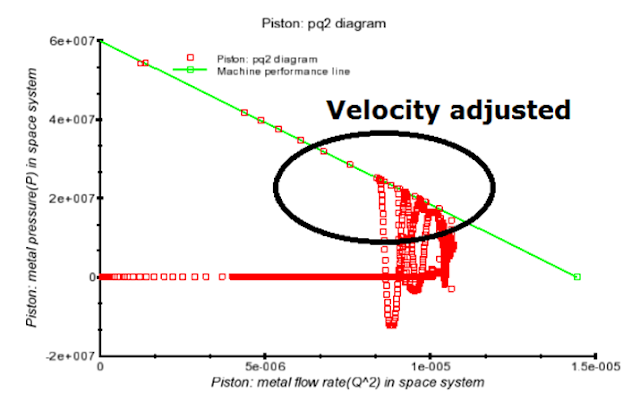 Once the pressure drops below the machine performance line, the piston will then accelerate towards the prescribed velocity. 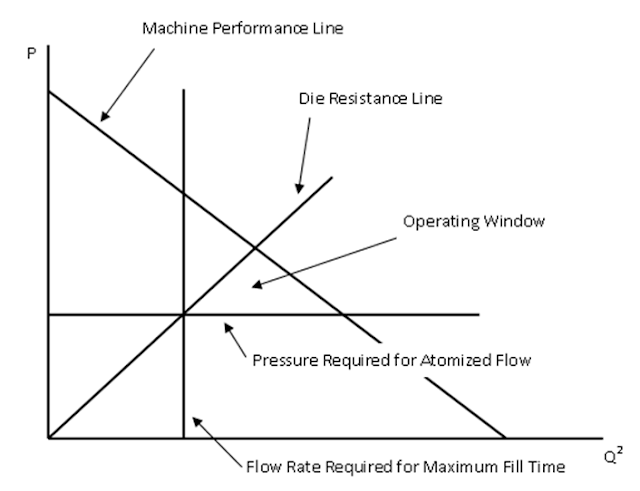 The P-Q2 diagram above indicates that adjustment may be needed to bring the pressure down below the machine performance line. 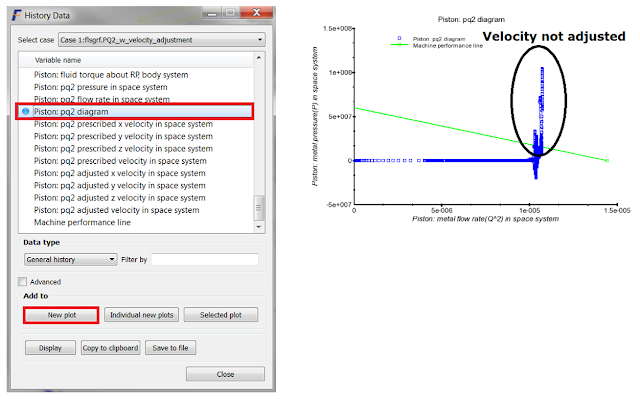 You can either toggle on the Adjust velocity option and retry (see Figure 5), or modify your machine parameters. FLOW-3D Cast v4.1 allows you to perform P-Q2 analysis that helps achieve desired fill time and optimum gate design. The analysis data can be viewed and processed in FlowSight, an integrated post-processor that comes with the FLOW-3D Cast installation.